As I write this, the sun has set in Cincinnati, making possible the darkness that is the vigil of Advent Sunday. This new liturgical season has come just at the right time, as it always does. This weekend saw both Black Friday and Thanksgiving Day, two sides of the American coin. Social media were abuzz with joy and wonder, and not a little self-righteous condemnation. Black Friday received more scorn than praise among my online friends. It’s easy to heap disapproval on Black Friday. In a nation blessed with astonishing abundance, people line up at odd hours to get bargains on things not many of us need. Consumption and greed appear to have triumphed at great cost, and not just to our credit card bills. According to one web site, seven people have died and ninety have been injured in Black Friday shopping incidents in the last few years. Is a new television worth risking one’s life over? Of course not. But then others are right to remind us there are other perspectives on the narrative of Black Friday. Shunning bargains may be a privilege for the wealthy. Perhaps those doorbuster specials afford some possibilities to people who have less money, those who need bargains. While plenty of news coverage laments the appalling low pay of retail workers, this holiday weekend may provide some much-needed extra income for retail employees and others. So while it’s easy to be self-righteous about the excesses of Black Friday, staying home might be a luxury that not everyone is able to partake in. But then, the internet being the internet, we saw plenty of self-righteousness going the other way. How dare you condemn Black Friday! Is Black Friday a celebration of greed? Yes. Is it also something else? Almost certainly. If Black Friday celebrates greed, our other weekend holiday celebrates something else. Interestingly, the collective narrative on social media uncritically praises Thanksgiving Day as a paean of gratitude. In its pure form, that is surely true. Here too, though, there is another perspective. It wouldn’t be hard to see Thanksgiving as a riot of gluttony. If one wanted to be self-righteous about it, there’s an easy narrative to construct about how we close down almost every hourly worker’s job for a day so we can eat too much and waste food (all the while re-membering the violent conquest of one people by another). I saw a few posts about the lies we tell ourselves in our historical narrative of the so-called first Thanksgiving, but not a single peep about the gluttony of the day. Why is one holiday (Black Friday) seen as the excess of culture made real, but the other holiday is accepted more-or-less as something noble, albeit with a complicated past? Perhaps it gets back to privilege. Plenty of us could choose not to head to the mall on Black Friday. We’ll go later. This allows us to condemn others from the vantage point of a perceived high road. But it would be nothing more than crass hypocrisy to condemn gluttony while we’re staggering around trying to digest a massive meal. And then there’s one more holiday this weekend. The holiday is the big Holy Day of the weekend, the First Sunday of Advent. We will pray for God to “give us grace to cast away the works of darkness, and put on the armor of light.” If ever we needed those words and that light, it is now. We have a lot to repent of this season. As the poor have less and less, the rich grow ever more wealthy. Our list of what we need (a 27 pound turkey! an 82 inch television!) gets longer and longer. Greed and gluttony are just the first two on the hit parade of sins today. We condemn first and ask questions later. Mostly, I think the underlying sin is our failure to trust in God, and the symptom of that failure is fear. Our culture is really good at fear. That is the message of Advent. It’s a message we need to hear, to pray, to sing, and to enact every year. We have God, and that is more than enough. By God’s grace, we have hope. With that hope, we do not need to be afraid. We don’t need anything else. We discover that we are already perfectly beautiful, every one of us, made in God’s image. Make no mistake about it. This season is penitential. Thanks be to God for that. It’s a different kind of penitence than Lent brings us. Rather than purging ourselves in the wilderness, we are scrutinizing ourselves and our world in preparation to welcome and to worship Jesus Christ. Let us all enter fully into this season of waiting, of preparation, of repentance, and of joy. Our world isn’t right, and neither are we. That’s why we desperately need a savior, and he is coming soon. That is really, really Good News. So let’s acknowledge our greed and our gluttony and all the rest. Let’s see it in the world around us, but in a spirit of hope — we can do better — rather than of condemnation. Let’s see our world as a broken place that is made whole in Jesus Christ. Let’s see this season of Advent as our chance to get ready to greet our savior when he comes, whether we meet him in the sacraments, in other people among the Body of Christ, in serving him among the most vulnerable of people, or at the end of all things. Scott, I appreciate this entry. Yes,enter fully. Good and bad. I put up my tree tomorrow and play Christmas Carols, even as we put away the gold and brass and put on the purple at church. I shun Wal Mart, but overspend on “Small Business Saturday” with the justification that I am supporting small, local businesses. Today I changed our outdoor signboard to say, “Prepare ye the way.” It’s a little like Mary’s pregnancy — let’s watch and wait and treasure it all in our heart, and see what’s born this year! Thank you so much for this timely and thoughtful post! Scott, it seems to me that the “complicated past” is the true and horrible gluttony of the holiday. Also, the abundant food does bless only some of us but I’m not sure much really gets wasted. After all, what’s the best part of Thanksgiving dinner? Yup, the leftovers. That said, I think that Thanksgiving Day needs to be separated from any pretense of an “historical” context. Let’s just have it because it is good to give thanks. I appreciate the idea that not all of us can afford to miss the bargains. Another thought: have we (the Church) somehow made Jesus inaccessible to many? And those many are full of fear – and emptiness – without much hope of a savior. So shopping and eating etc. can seem to fill the void and cover the fear. Yes, we do need a Savior. Thank God, our Savior is already with us and always incarnating and there is still hope that we can be Jesus for others who can’t yet see. Thanks, Ann, Elizabeth, and Susan, for your comments. While it’s true that most of us eat most of the food in the form of leftovers, I’d argue that eating too much is wasteful. That is, when I eat more than my share, I’m consuming resources that could have been useful elsewhere. But I agree fully with your desire to set aside a day to give thanks! Perhaps we’ve made Jesus inaccessible, or maybe we’ve never invited people to know him. I enjoyed your thoughtful post. Thank you. I think that both are true: we’ve made Jesus inaccessible (i.e., people are frequently afraid of being judged, or of just feeling awkward, if they come among us, so they don’t) and that we have not invited people to know him in a way that makes sense to them. I so wish that I knew how to do the latter for the sake of everyone I meet, because knowing the love of Jesus is freedom. Hmm … maybe the mistake I make is in thinking that I have to explain this in words when an acknowledgement that words are inadequate and an invitation to come and see for yourself is all that is needed. Thanks, Scott, for your reflections. And for a place to comment. Allowed me to actively reflect, which I don’t do often enough. 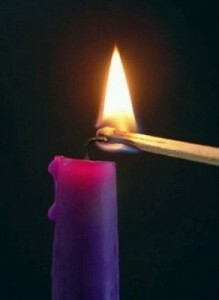 Blessings for a Holy Advent.